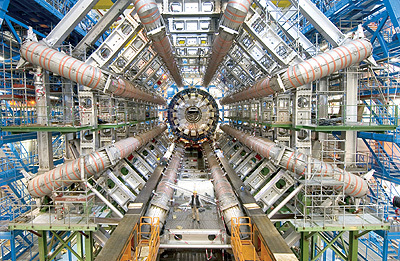 The massive ATLAS detector dwarfs a worker standing in front of it during installation at the Large Hadron Collider. UCSC physicists have been working on the ATLAS project since 1994. Image courtesy of CERN. 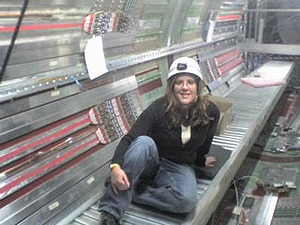 Former UCSC graduate student Jessica Metcalfe takes a rest on the temporary catwalk inside the ATLAS cryostat at CERN, where she was installing cables to be connected to the detector's inner tracker. Image courtesy of A. Grillo. 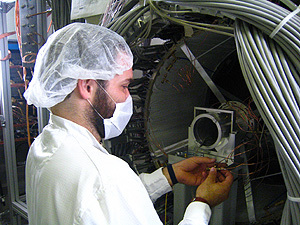 SCIPP technician Forest Martinez-McKinney prepares cooling-pipe connections for the ATLAS tracker at CERN. Image courtesy of A. Grillo. Note to reporters: You may contact Seiden at (831) 459-2923 or abs@scipp.ucsc.edu, Haber at (831) 459-4228 or haber@scipp.ucsc.edu, Dine at (831) 459-3033 or dine@scipp.ucsc.edu, and Grillo at (831) 459-3705 or grillo@scipp.ucsc.edu. More information about the LHC and U.S. involvement in the project is available at www.uslhc.us. Information about SCIPP is available at scipp.ucsc.edu.